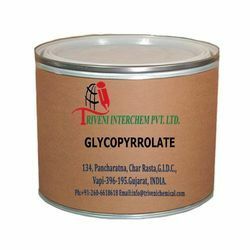 Leading Manufacturer of glycopyrrolate from Vapi. Glycopyrrolate (596-51-0) is Solid. it is use in Anticholinergics, Central nervous system (CNS) Industry. Storage: Keep container tightly closed. Keep container in a cool, well-ventilated area. Looking for Anticholinergics API ?